This is just wrong. Kinda reminds me of a cross between a squatch and Mike Commodore. Gritty seems to be the talk of the hockey world. I can't imagine why. 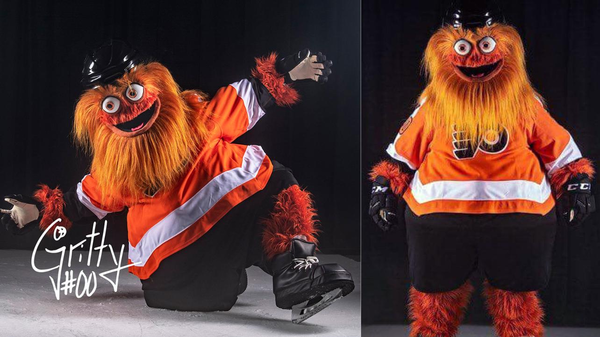 For me Gritty looks like a pumpkin that was left on the porch after Halloween and grew fur. Rumor is the lovely Philly fans started a go fund me to euthanize it. Just a rumor though. Another description might be Mountain Man on Meth. That thing is going to haunt a lot of kid's dreams. Well they live in philly. Lots worse nightmare stuff there unfortunately. Something new to boo. Santa is a sensitive dude, he can't take it. Calm down man just take my money! Looks like a coked up Mongo. And so ends - forever, apparently - the era of Mr. Snider. Thanks for bringing hockey into my life, Ed. Too bad the organization's heirs entirely lack your class. 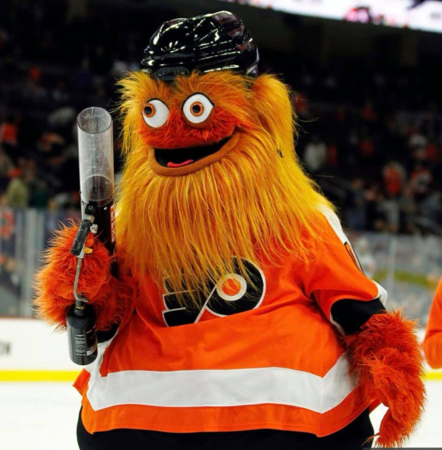 Fitting mascot for the orange P(ee)? I didn't know where to stick it, but found the common word "creepy"
Well, Tommy Hawk has some nice moves on this takedown of a fan. The story is the fan attacked him first. I watched the video and was in tears laughing. Tommy Hawk and the fans are having a frustrating season. In keeping up with the happenings back in Chicago, don't be surprised if that isn't the only incident. But hey, Johnny Teows, Duncan Keith, and Brent Seabrook are getting paid mega-bucks $$$ to under-perform. I remember as a kid watching them get their doors blown off by the Minnesota North Stars, Detroit Red Wings and Edmonton Oilers. I think those days are back for the foreseeable future. However, I believe they are in full “tank” mode. I guess it’s better to languish for a while and speed up the chances of getting some top picks than to die a slow death through mediocrity (see Red Wings) with false hopes at “one last run”. I believe LA is right there with them, and Pittsburgh isn’t too far behind. You can also add the Rangers to that category. and Pittsburgh isn’t too far behind. Apparently they don't think so, what with extending JR. He's the go-to guy when you want to sell of everything for another year or two of glory, not the guy you want to rebuild with. If they truly go into a rebuild with him at the helm, i think we'll all be able to forget about the Pens for a while. I do think they're on their way to that, but not for another couple years - as much as i hate to say it, you know they're going to make a run pretty soon here and go deep in the playoffs. I'd giggle if they didn't, though. We’ll see. Winning a couple Cups seems to keep the rose-colored glasses on when it really isn’t so rosy. Both Chicago (in 2016-17) and LA (2015-16) want with that “all-in” “sacrifice the future for now” to buy an extra year or two. It’s really not a bad concept if your core is still solid. Those chances don’t present themselves too often. I think Pittsburgh is probably going to follow suit being one year removed from their last cup. They are mediocre and I think their best days are behind them. I don’t blame them from a competitive perspective from throwing all the chips in the middle of the table at this point.